I grew up in a town with distinct class lines. There were the WASP captains of industry, the grandchildren of the great industrialists of the 19th century who made the city into The Hardware Capital of the World. They were tended by the professional middle class, diverse in ethnic origin, and ambitious. These doctors, dentists, and lawyers were in turn served by the painters, electricians, and plumbers who had few aspirations except solid American ones – Kinder, Küche, Kirche and a week at the shore. Finally there were the factory workers who turned out tools, ball bearings, and locks; and their wives who cleaned house for the West End. The workers of New Brighton were Polish immigrants – nine-to-five, no benefits, galley slave working conditions, Saturday afternoon picnics in the park, and kielbasa and church on Sundays. They were the shadowy forms that we saw on our way to Jimmy’s to ogle girly magazines or to play baseball on the green. Other than that they did not exist. They were as far from the Club, the Vineyard, Cape Cod, or even Misquamicut as Jupiter is from Neptune. The history of New Brighton is a history of the Carpenters, Moores, Streeters, and Franklins who brought flinty New England parsimony, enterprise, ambition, and practicality to the Connecticut River Valley and built the industries that provided the arms and materiel that ensured a Union victory in the Civil War. Before that these visionary settlers forged flintlocks and bayonets to supply Washington’s Revolutionary armies. For two hundred years these adventurers, entrepreneurs, and capitalists provided the intelligence, wealth, and enterprise to build New Brighton, Connecticut, and the Union. The Frederick Law Olmsted park, a public space that was designed to preserve local flora, provide light and air for factory workers, and created a recreational space and a Walden-like oasis in the midst of a dynamic industrial city, exists thanks to their wealth and civic engagement. The laborers in the many factories of New Brighton were a dime a dozen and immediately replaceable. Warsaw, Lodz, and Gdansk got the news of corporate expansion and hiring almost before the workers on Arch Street. Managers at Ruff & Billings had to turn away applicants for the most menial work. Hundreds if not thousands of Kowalskis, Mylnarksis, Granskis, and Pulaskis were lined up outside the doors of every factory in New Brighton. 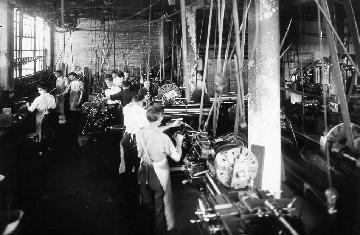 Thanks to cheap labor, permissive labor laws, and hardworking, America-or-bust immigrants, the factories were always humming. The town grew and prospered. There were more and more shops along Broad Street in the Polish section of town. Immigrant labor kept Jimmy’s alive as well as the Burritt Hotel, the New Brighton Diner, and Clean-‘em-Well dry cleaners. The Polish immigrants were happy because they had escaped the hardships and penury of the old world. The painters, electricians, and plumbers were happy because the local economy was humming; and the captains of industry were delighted to see their bank accounts swell, their children’s trust funds prosper, and a three-home retirement just over the horizon. The enduring myth of labor in America is that of Walt Whitman. “I hear America singing”, he wrote. As the industrial age faded and employment was transformed from the factory floor to the downtown office, the office secretary was said to be the most important employee of any office. Without her, work would stop. Interoffice memos would pile up. Communications with clients would amass into a giant backlog. Middle managers would never be able to find critical files. No matter how much creative vision, enterprise, jawboning, and negotiation on the part of senior management, the real work got done down in the trenches. The Twenty-First Century will be the first without labor. Intelligent machines will replace grunt- and donkey-work. The often ornery pipe-fitter, steam-press, or lathe operator will be things of the past. The labor movement has been neutered and is but a shadow of its muscular, intimidating self of the 1930s. Labor has lost out to capital and will never regain its place and position. How can it? The likes of mobsters like George Meany, Jimmy Hoffa and their Mafia goons are long gone. Without the strong-armed tactics of yesteryear, labor has little power or strength. It has the predictable ‘progressive’ support of academics and New York liberals; but this enthusiastic endorsement is loud but toothless. It has no Metternich, Machiavelli, or Kutnezov. No FDR, Steve Jobs, or John D. Rockefeller. While working in Poland after the fall of the Soviet Union, I was surprised to hear of the summary dismissal of Lech Walesa, the Solidarity Gdansk shipyard worker hero. In many ways the was the man who led the Communist bloc in their revolt against the Communists and who was responsible for coalescing thousands of workers in their revolt against Soviet totalitarianism. I soon found out that although the aristocratic Poles poised to take over the reins of government respected Walesa for his courage and pluck, to them he was an ignorant peasant, a worker, a factory drone, and totally unacceptable to lead the country. Poland like all European countries has a long and storied noble history. Polish royalty intermarried throughout Europe and the aristocracy was among the continents most polished, sophisticated, and wealthy. To even consider a peasant like Walesa was anathema. The working class was created by upper class capitalists who understood the fundamental economic relationships underlying liberal economies. It was capitalists who created the institutions within which labor would provide manpower and brawn and managers were created to organize it. Capitalists had the intelligence, insight, and entrepreneurial skills which enabled the working man to make a living. Labor in the second decade of the 21st century has been scattered and loosely affiliated within corporates structures. Intelligent machines have progressively taken over brawn and foreman-level abilities. The workplace is an amalgam of low-paid human labor and efficient, low-cost robotics. There is no doubt that this decade is a scary one for American labor. The working man has certainly been marginalized and replaced. Traditional jobs in industry have been outsourced or automated. While politicians tout the genius of the American economy and the will of the American worker, they are giving only empty promises. It is unlikely that poorly-educated citizens residing either in dysfunctional urban inner cities or semi-rural trailer parks can possibly make a go of it in an IT, fast-moving economy. No amount of technical training or vocational education can possibly compensate for an undisciplined, often aimless upbringing, modest intelligence, and the insupportable weight of bad genes and bad environment. The labor movement is dead. Labor is dead; and the challenge facing American leaders is not how to revivify the Teamsters, or the American Federation of Teachers, but how to square the country’s ill-abled with its most-abled. No one has offered any but the most shopworn and tired answers. I do not celebrate Labor Day, and would propose Enterprise Day to replace it. A day to honor the most enterprising, creative, innovative, intelligent, and risk-taking among us. It will be a day to honor those schools which reward talent, initiative, and high performance; a day to acknowledge those students who have graduated because of their own abilities, ambitions, and high goals. Only if America shifts its polarity from disadvantaged to highly-talented; gives up a n agenda of entitlement and public welfare; and adopts one based on forward-thinking enterprise can the country regain the individualistic centrality of its founding days.